Restaurant brunch, a vegans worst enemy. The menus are full of eggs, bacon, sausage, all big no-no’s. It doesn’t get much better when it comes to the waffles, pancakes, french toast, or parfaits. All which generally contain eggs, milk, or yogurt. So what happens if you are vegan and go to a restaurant for brunch that doesn’t cater to vegans? Usually I’ll end up with a salad, toast, and some fruit, or some other waiter collaboration, which is fine, but ordering a fancy dish straight from the menu: not going to happen. So the excitement and joy when you find somewhere that serves vegan brunch? Well I’ll just be dancing happy dances all the way right into that restaurant. 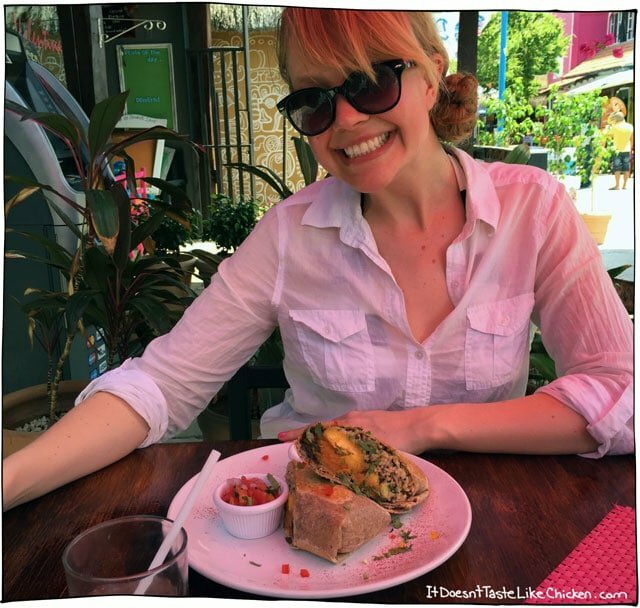 Which is exactly what happened in Isla Mujeres when I came across Lola Valentina, a little restaurant that had an entire section of the menu dedicated to vegan brunch options. Challenge accepted, cue the happy dance. Even though it was already 2pm in the afternoon, I refused not to go for brunch. 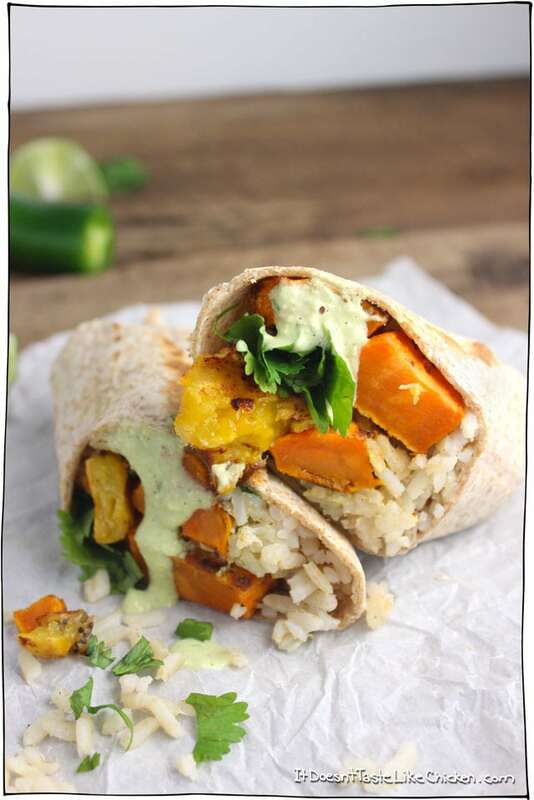 Once I had a look at the menu, the sweet potato and plantain burrito was exactly what I needed. Immediately please. I don’t know how it was prepared at Lola’s but for my version, I decided to toss the plantains and sweet potato in spices and roast them. Which is both because I am lazy and tend to avoid cooking ingredients in multiple pans, and because I didn’t want to fry the plantains in a lot of oil (the way plantains are most commonly cooked). The result is soft in the middle, caramelized on the outside, sweet, spicy, why-don’t-I-make-these-everyday-good. Then, I took it a step further and made a Cilantro and Lime Sauce to go with the burrito and ohmygoodness. Yes please. More please. Now please. I find most grocery stores have them, at least in my hood, but if yours doesn’t look in Caribbean grocery stores. When you buy them they may be yellow or even green. Boo hiss. Take them home, set them on your counter and wait for a couple of days. You want them to have lots of black spots like in my picture. Even spottier is better. The more black spots the sweeter the plantains will be. You can peel them like a banana, but sometimes thats difficult to do, so just slice an end off and cut slits lengthwise to pull off the peel. Slice them diagonally (just because it’s pretty) into 1/4″ thick slices. Then peel and chop up the sweet potatoes into pieces that are about half the size of the plantain slices. The plantains will cook faster so making the sweet potato slices smaller will help them finish cooking at the same time. 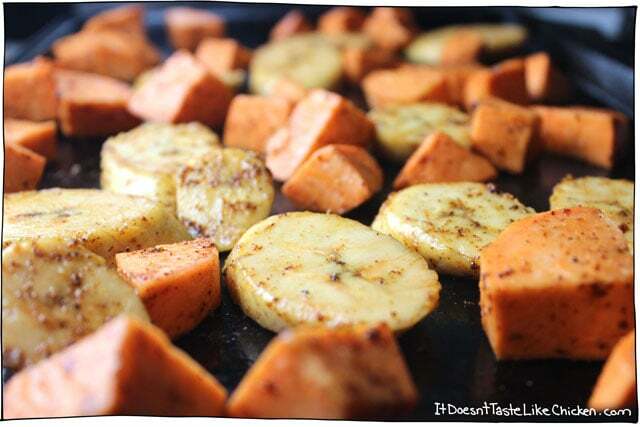 Add the plantains and sweet potatoes to a bowl and toss with all of the delicious seasonings. The cayenne is optional, but if you want the spice kick, I recommend it. If you are a timid spice liker, then 1/8 of a teaspoon will do (or a wee pinch). 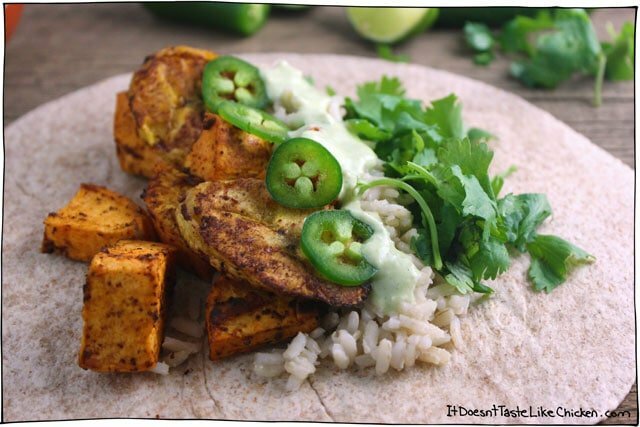 While the plantains and sweet potatoes are in the oven, you can make the Cilantro and Lime sauce. Just dump all the ingredients into a high speed blender, and blend. Presto, delicious sauce. 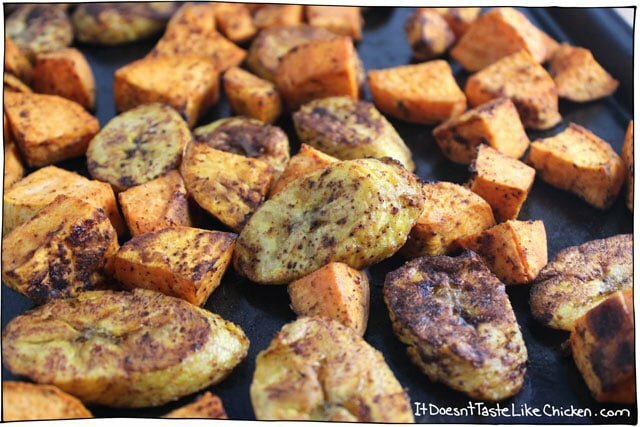 Roast the plantains and sweet potatoes, flipping halfway through until they look like this. Omnomnomnom. Creamy on the inside, caramelized on the outside. I think I devoured half of the tray before I even got to making the burritos. Lay out your tortillas, and fill your burritos with all your favourite fillings. I went for brown rice, extra cilantro, jalapeños and then a generous drizzle of the Cilantro and Lime Sauce. 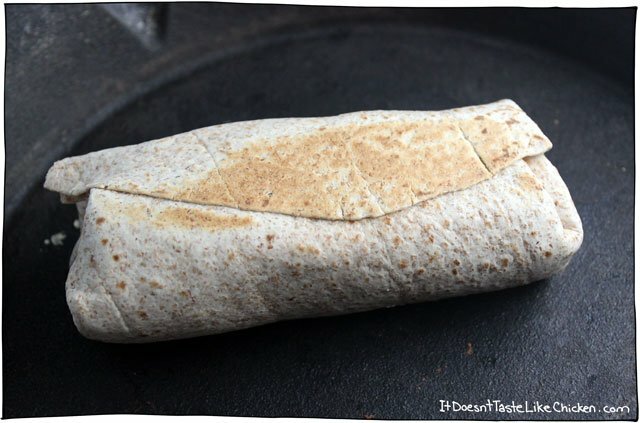 Make the burrito by folding the top and bottom over, and rolling it up so all the yumminess is trapped inside. For the finishing touch, heat a dry pan (no oil!) over medium-high heat, and place the burritos with the flap side down. Let that toast for 1-2 minutes until it’s golden brown on the bottom. Flip and toast the other side. Your burrito will be sealed shut like in the photo above so that you aren’t stuck with the can’t-set-burrito-down syndrome. Toasting the tortilla also brings out the flavour so its a win-win! Serve with extra cilantro and lime sauce on the side. The sweet potatoes and plantains are roasted so they are creamy on the inside and caramelized on the outside. Perfect for a summer nights meal. 1/4 teaspoon cayenne optional, will make it spicy! cooked rice, black beans, cilantro, jalapeño, sliced peppers, corn kernels, the lime and cilantro sauce (recipe below), or whatever else you want to layer into your burrito! Preheat your oven to 400F (200C). Lightly grease a large baking sheet. Add the plantains and sweet potato to a bowl with the olive oil and all the spices. Toss to evenly coat. Spread the plantain and sweet potatoes across the baking sheet in a single layer. Bake for 15-20 minutes, flipping once halfway through. They are done when the sweet potatoes and plantains are soft all the way through and browned on both sides. 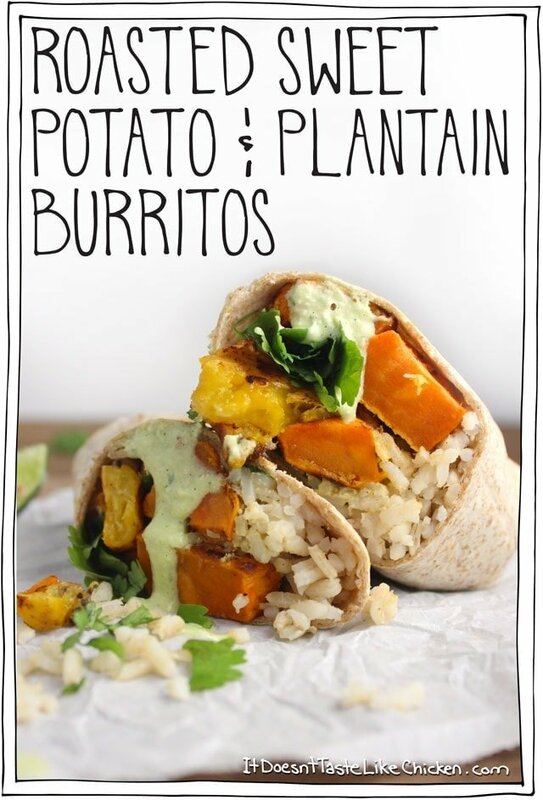 Fill a tortilla with the sweet potatoes and plantains, and whatever other fillings you like. Rice, black beans, cilantro, etc. Fold over the ends and roll them up so all of the fillings are trapped inside. To seal the burritos closed, heat a dry pan over medium-high heat. Put your burritos seam side down. Toast the burritos for about 1-2 minutes until golden, then flip and toast the other side. This seals the burrito so that it won't fall open, and the toasted tortilla tastes amazing! Don’t forget the cilantro and lime sauce! This is also great as a dressing for salads. 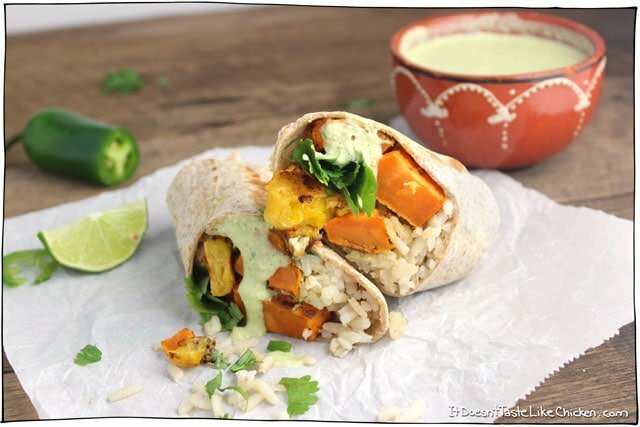 A simple cilantro lime dressing that is perfect on burritos or any salad. Add everything to a high speed blender, such as a Blendtec, and blend until smooth and creamy! If you don't have a high-speed blender, you will need to soften the cashews first. Cover the cashews in water and boil for about 10 minutes until tender. Drain, rinse and continue with the recipe using ¼ cup + 1 tablespoon water (instead of the full 1/2 cup of water). Featured Ingredients: Plantains and lime. 54 Days, 30 recipes to go. This recipe looks wicked crazy good!! 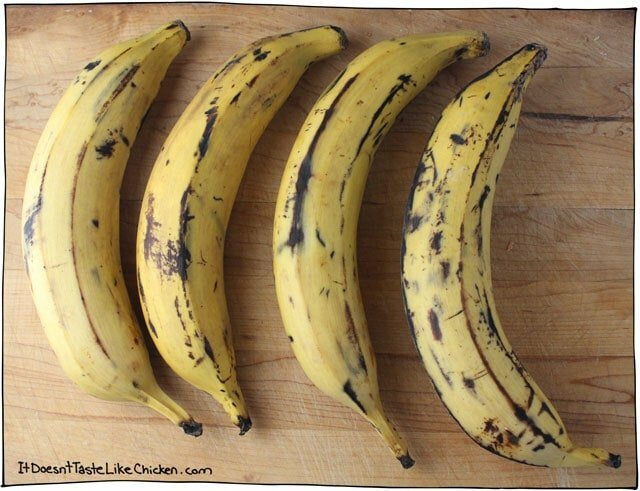 Regarding the plantains……when they look like the picture you posted, then they’re good to go? Or…should they be spottier? I’ve bought plantains before, but sadly never used them ‍♀️ Plantain fear?? Thanks Denise! I would say the plantains I posted are good, but if yours had even more spots it would be even better (but not entirely black). Enjoy! I’d picked up some plantains, thinking “Something with pecans, maybe?” But then I saw this recipe and had to try it. Some family members have trouble with spicy peppers, so I used a mild curry powder instead of the chili and cayenne, upped the amount of garlic, and added a thick smear of garlic hummus instead of rice to a whole wheat tortilla. Really good results, will make again. I just had leftovers for breakfast. So very happy you loved them so much Catie! I do the same thing when I make them, just eat them straight from the oven. Haha. Thanks for sharing! How did I miss this recipe!!!??? I have no idea what to make and I literally just said to the boyfriend “All we have are sweet potatoes and Plantains” Seriously? I never thought to put them together in a burrito recipe! Soooooo making this!!!!!!!! Made these last night – Another HUGE hit from your blog, Sam. Love the dressing; and the idea of using sweet potatoes and plantains. 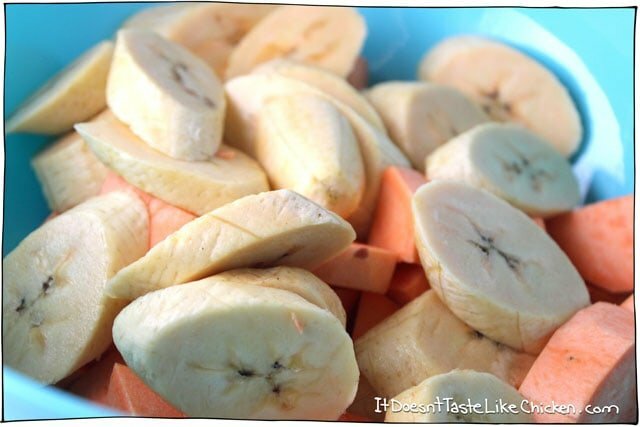 I love plantains – so this was a no-brainer recipe to do!!! So delish!!! You rock, girl. Thanks for leaving your review, I know everyone finds the reviews helpful! Hi! This is the first time I decide to leave a comment. My name is Samantha, I´m from México and I´m vegetarian. 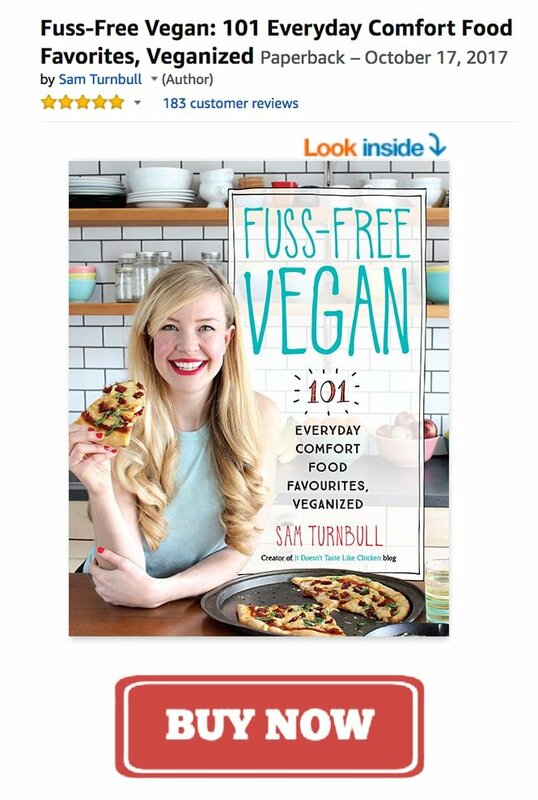 I have to admit that find some interesting-delicious-and-creative recipes that don´t use meat is very, very complicated. So, one day (a magical day!) I found your website and instantly I fell in love of it. (Imagine my face when I discovered that the person who had shared a lot of vegan recipes was named Sam) Aaaaaaaand, what I was saying? Oh yes, that I´m so so so thankful with you for saving my life (or, at least my time-of-eat life) Thank you! I believe that you have one of the most useful and funniest sites in all this world. The most important thing: you never stop to upload new recipes. 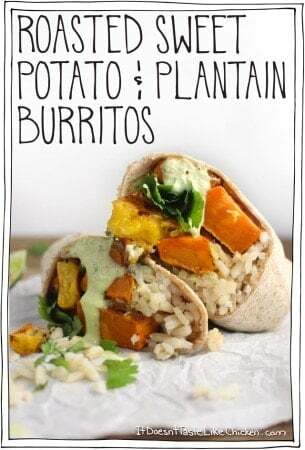 I had never thought cooking a burrito using sweet potato (“Camote” in México) and plantain (“Plátano macho”, also, in México). But, you gave me other idea of how to revolutionize my food. (My friends start thinking that my breakfasts are bored). The only thing that I can say about this recipe is that, there are a lot of calories inside of each burrito. However, I should try it. Thaaaaank (again) you! A LOT. Thank you so much for your amazing comment!! You totally made my day. I don’t think there are too many calories in the burritos, considering the average person needs 2000 calories a day, but if you are trying to cut calories, you could always have a smaller burrito (the recipe is for a huge one), and fill the rest of your plate with salad. Thank you again for the lovely comment! I am looking forward to seeing you around the blog. Let me know if you ever have any questions. YUMMO! I would eat these morning noon and night! I just had girl friends over for the weekend – I wish I would have had this recipe for brunch! Definitely on my list to make. Thank you. GET IN MAH BELLEH! This looks insane! Still not a vegan. Who cares. I am sooooooo making this! Thank you! One animal free meal is a lot better than no animal free meals!! 😀 Enjoy the recipe heleen! Great recipe ! It really sounds delicious. Excellent photos. I think that we should have Sweet Potato & Plantain for breakfast tomorrow.